A short 45-minute ride from Louisville, Moore is currently harvesting apples and pears from 50 fruit trees, plus a wide variety of heirloom tomatoes, summer and winter squash, cucumbers and other late summer/early fall produce. Come October, cold crops such as Swiss chard, cabbage and broccoli will be ready for the picking. In his dual role as executive chef and pastry chef, Moore creates both sweet and savory dishes from his bounty. A Pear Tart with pastry cream and Apple Crumble Cake are two favorites on the dessert side; Roasted Fennel and Pear Buttermilk Cold Soup was a late summer special. Boscs and Bartletts make up the pear crop, while apple varieties include Pink Lady, Gala, Cameo, Honeycrisp and Yellow Delicious. 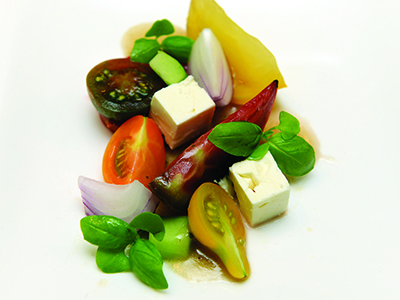 On the appetizer menu, tomatoes rule in September; Moore runs a Mediterranean heirloom tomato salad as a daily special—often paired with lemon cucumbers and fresh herbs. Pastas are a mainstay of Volare’s Italian menu, and Moore makes several from scratch every day. “That requires a lot of eggs,” he points out, “and I source them fresh from my Dad’s farm.” A specialty is Hen Egg Ravioli with ricotta, parmigiano and brown butter. Pasta with caramelized pears, parsley and seared scallops is a seasonal special. Moore works with several small producers to source unique, high-quality ingredients. One of his favorites is Kentucky cheesemaker Giovanni Capezutto, founder of Sapori Italia Cheese. He creates cheeses in a style rarely seen in the U.S., based on recipes he learned from Southern Italian country cheesemakers when he was growing up in Naples. The Rustica alle Noci—a sweet cheese studded with walnuts—is a favorite of Moore’s. For produce that he can’t harvest from his own farm or other local growers, he relies on supplier Creation Gardens. “I change my menu four times a year and always include a filet and rib eye in a preparation that fits with the season,” he notes. Certified Angus beef is his meat of choice; right now, he’s serving the filet topped with melted leeks and sautéed shrimp, enhanced by a garlic-shallot-herb compound butter and a splash of Woodford Reserve “in tribute to Kentucky’s Bourbon Trail. I always like to put three vegetables on the plate, too, for color and contrast,” Moore adds.